Nag screen every 9 minutes. 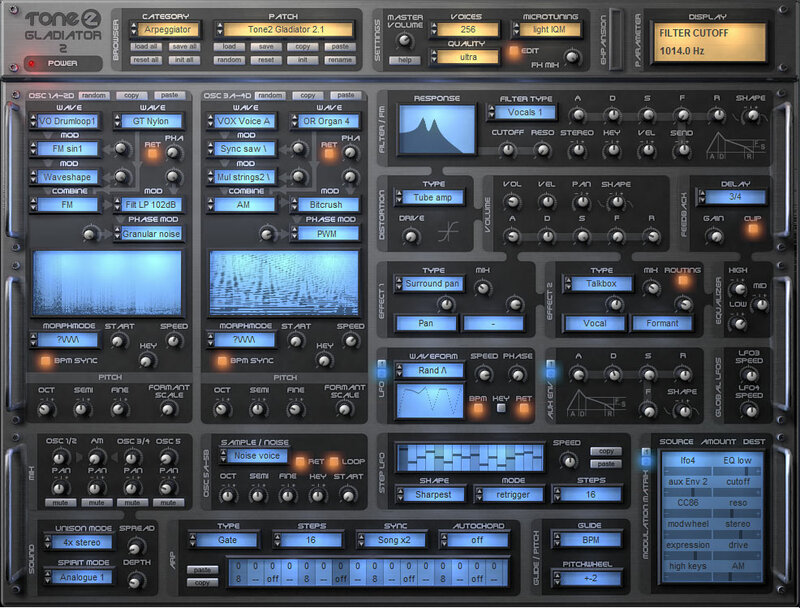 Gladiator is a powerful synthesizer based on the concept of Advanced Harmonic Content Morphing (HCM) Synthesis. This new synthesis method is based on a large and expandable repertoire of standard waves like saw or pulse as well as complex waves like multi waves, trumpets, organs, pads, pianos, and voice samples. These waves can be modified in real-time by, for example, transposing the wave by one or two octaves and adding it to the original wave, altering its harmonic structure, syncing, compressing or expanding the frequency domain of the spectrum, making the wave fat using only one oscillator by transforming each wave into a supersaw, selecting some cycles of a sample and moving through them over time (comparable to wavetable synthesis), etc. Any modification of a wave can be modulated producing lively shimmery sounds (note: with only one oscillator). In total there are more than 30000 different spectra available for combination and modulation. 64-Bit VST & AU versions for Mac (requires OS X 10.5 or higher to be installed). 64-Bit standalone version for PC. PDF manual can now be be viewed from within the plugin (Mac). Smart installer for PC which automatically detects the plugin directory. Workaround for a Windows problem whenever the mouse button is clicked for a long time. Fix for a possible permission problem in OS X Lion / Mountain Lion. Scroll-bars in standalone version for lower resolution displays. Gladiator now ships with 1135 sounds (30 new ones have been added). Progression and Workstation soundsets now have their own patch browser category. Improved sound quality: Better psychoacoustic processing and cleaner sound. Slightly improved usability and workflow. Important pop-ups are always displayed on top. More precise fine tuning of knobs with shift+left Mouse Button. Additional low pass filter: LP Superfat. New modifier: 'Time Delay', delays an oscillator's spectrum. New modifier: 'Pitch Harmonizer', stacks up to 16 additional harmonics. New modifier: 'Pitch Octaver', stacks up to 8 oscillators tuned in octaves. Hotkey 'm' resets the mod matrix. The interface now displays the user name above the preset browser. Smoother analog like characteristic sound. Chorus and ensemble have been replaced with analog modeled versions. Moog filter now supports 'self oscillation' for high resonance. Improved LP 12dB Analog, BP 12dB Analog and HP 12dB Analog filters. Improved protection against corrupt installations, or registering with the wrong keyfile. Fixed: System freeze / crash happening with certain system configurations (PC). Fixed: User name was sometimes displayed incorrectly (Mac). 'Comb1', 'Comb2' filters have been renamed to 'Comb+' and 'Double Comb'. Fixed: a possible crash when MIDI CC 121 was used. Fixed: Two spectra were missing due to invalid filenames (Mac). Reworked factory presets to reflect engine quality improvements.